The first freedom fighter and martyr Shree Mangal Pandey was born in village Nagwa District Ballia. He was famous for bravery amongst his colleagues.An english scholar “Fisher” has written that Shri Mangal Pandey was having all qualities of a good soldier. He was so brave and capable to embrace his death peacefully. According to the records available in Jabalpur museum( general order books). Shri Mangal Pandey was due to be executed on 18th April but he was hanged ten days before i.e. 8th April and it was kept secret. Because english rules were well aware of the fact that if Mangal Pandey remains alive it will endanger British rule. 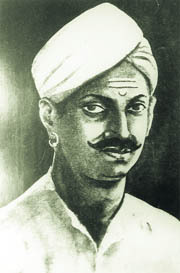 Thus Mangal Pandey became the first freedom fighter and martyr of 1857. The name of Mangal Pandey became an emblem of revolt against British rule. He was a soldier of the 34th Native Infantry whose attack on a superior officer came to be recognised as the event that sparked India’s First War of Independence. Little is known of his life before that momentous incident but he has been declared a martyr since. On March 29, 1857, at Barrackpore near Kolkata, Mangal Pandey started an open mutiny, inviting his comrades to join him. Pandey attacked his British sergeant and wounded an adjutant. The office in charge, General Hearsay, noticed that Pandey was in the throes of some sort of ‘religious frenzy’, and ordered a jamadaar to arrest him. The latter refused. Surrounded by guards and European officers, Pandey tried to commit suicide by shooting himself. He was seriously wounded, and promptly arrested. Following a court-martial on April 6, he was hanged at Barrackpore on April 8, 1857. As a collective punishment for his act, the entire regiment was also dismissed. According to records at the Jabalpur Museum, Pandey was to be executed on April 18. But he was hanged 10 days earlier to prevent the regiment from harbouring ill will against superiors. The English were also aware that news of Pandey’s death could spark more unrest. Going by the date on which he was executed, Mangal Pandey became the first freedom fighter and martyr of 1857. His name has since been synonymous with revolt.